Rio Grande Valley Birding Festival, TX. November 2- , 2016. I currently have two talks – My Accidental Big Year and Hawai’i: The Extinction Capital of the World. Both are about an hour long. They feature images of birds, my wife, our cats and are mildly educational and may make you laugh (hopefully for the right reasons). Descriptions are below. Please get in touch if you’re interested in hearing me talk. ge high pressure technology and condense it into a Big Hour. Come hear about exotic birds, remote places, volcanoes, polar bears, Aleutian plumbing and more! 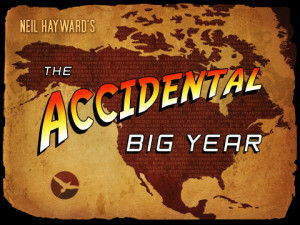 Government health warning: Big Years can be contagious. High pressure technology not previously tested. Hawai’i has it all: sun, surf, drinks with umbrellas, and birds everywhere. It’s like someone left the door open on a huge world aviary and all the birds flew out: Mannikins, Francolins, Waxbills and Munias. But something is rotten in the state of Hawai’i; more than half of the endemic species have already disappeared and the rest are barely hanging on. 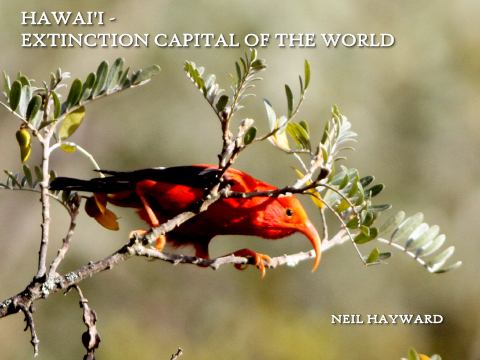 The Honeycreepers of Hawai’i represent a remarkable example of evolutionary speciation like Darwin’s Finches in the Galapagos Islands. Come hear about these extraordinary birds, find out about some of the conservation efforts to save them, and learn how to pronounce the letter ‘. Sun and surfboards not provided. Please bring your own umbrella drinks. BOOK LAUNCH! READING AT HARVARD SQ. CAMBRIDGE, MA.